Here at Mumberry, we are committed to giving you ladies the BEST workout clothing available to help keep you moving and healthy during your fit pregnancy. And did we mention looking incredibly stylish? In this series of blog posts, we’ll detail what to look for when shopping for maternity workout clothes and what makes Mumberry the best for mums who move! Today is Part 2 of our series! What’s our subject?? (drum roll please…) BELLY SUPPORT! I think all of us can agree there is nothing more important than adequate support for your growing bump during pregnancy. There are a few different options to choose from when it comes to belly support including belly panels and support belts. Let’s go over the pros and cons of each, because ladies, we’re in this together! Underbelly maternity pants have a stretchy waistband that sits below the belly. Since the waistband contours underneath your belly, it offers support where you need it most. Underbelly pants also transition well to your post-delivery wardrobe as they have no obvious belly panel. However, some may find that the waistband cuts into the stomach, making it very uncomfortable to sit down. This style can also create some bulk that is noticeable under your clothing, making discreetness troublesome. Another problem is the pants may fall down in the back as they ride so low under the belly. You have enough to worry about, let’s not add mooning others to the list. Pants that feature a full belly panel provide full coverage and support by extending over the entire abdomen. It is great for all 3 trimesters, since it grows with you. It is ideal both during and after pregnancy because it provides better coverage for things you don’t want seen. The full panel helps to smooth out that frustrating muffin top during the early stages of your pregnancy and having the full panel also helps your pants stay up. However, since the panel covers the entire belly, some women find this style to be too hot, and if the fabric used is not high-quality, it can be itchy. No thank you! Stand-alone support belts come in many different styles and may include adjustable Velcro straps, buckles, stretchy fabrics, etc. 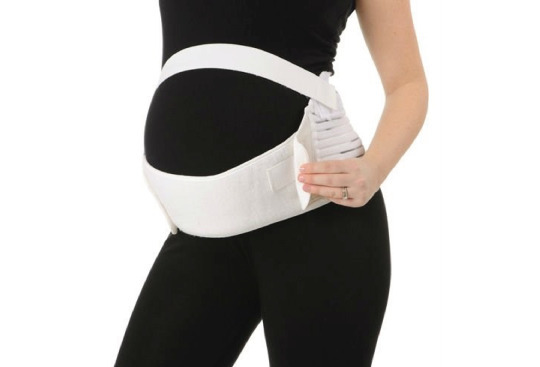 These belts surround your bump and help to distribute the weight of your belly to your back and/or shoulders. They can also help to support your back and ease the pain that comes with that extra bundle you’re carrying. Though most styles work well, they are hard to hide under clothing because they are so bulky. And bulkiness never was happiness! Some other complaints about these belts is that your movement may be restricted as they are often made of tough, non-stretchy materials. They can also be difficult to put on, sometimes requiring more time and assistance than most women have. We may be a little bias, but we truly believe Mumberry beats all of these options. With our patent pending Mumband™ belly support, all Mumberry clothing provides the benefits of both a full belly panel and a support belt TOGETHER! The Mumband™ provides full coverage and support by extending over the entire abdomen plus offers underbelly support with an additional elastic support band that sits under the belly. We covered fabrics in Part I but just a friendly reminder that the Mumband™ is made of high-quality nylon fabric that not only wicks away sweat, but also offers slight compression for a “held-in” feeling. The fabric is not only incredibly supportive, but retains its stretch so it grows with you during all 3 trimesters, as well as after the baby is born. And the best part is that the Mumband™ is completely hidden support – it’s constantly working hard for you without adding bulk or visible lines under clothing. Not only does Mumberry include the Mumband™ in all our styles of Bottoms, but also in our Tops! Wearing them together gives you DOUBLE the coverage and DOUBLE the support. And since you have so much support, you’ll have DOUBLE the energy! And DOUBLE the swag! To learn more about how the Mumband works to support you and your growing bump, check out https://www.mumberry.com/pages/mumband.